Stress can have serious mental and physical effects on adults. As people look for creative ways to unwind, it’s no wonder that adult activity books have taken the world by storm. Wouldn’t it be nice to be as carefree as a child again? These books for grownups are designed to promote relaxation and. “Mindfulness,” a meditative practice with Buddhist roots meant to help people achieve a state of active, open attention on the present, has experienced growing popularity, leading to classes, books, research, and apps on the subject. Activity books can assist with such mindfulness by offering a simple and fun way to calm the mind. If you think about it, how often are you able to focus intently on something for an extended period of time that wasn’t a smart phone or a computer? 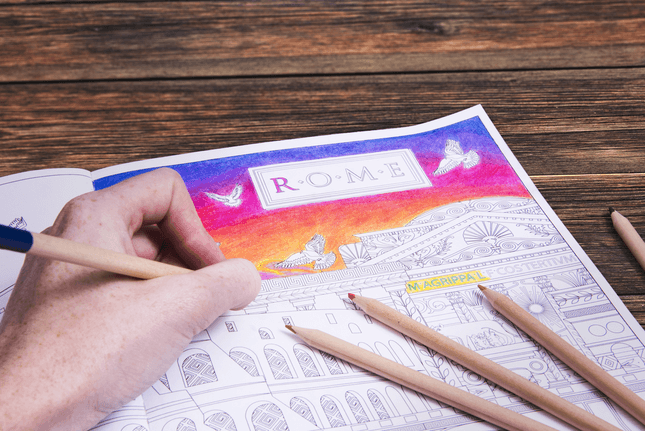 Creatively illustrated and designed activity books are a healthy way for people to feel more relaxed and temporarily escape from their hyper-connected lives and clear their minds by focusing on a single activity. Rand McNally’s line of therapeutic and mind-limbering books is here to help you reap the benefits of this simple and fun pastime. The new book features 24 cleverly designed seek-and-find challenges that put readers’ navigation skills to the test. Each puzzle features a section of a state map from America’s #1 Road Atlas along with a starter clue. Readers can choose states to explore by searching out the puzzle challenges featuring cities, towns and counties; lakes, ponds and rivers; parks and campgrounds – all unique to the state. For stumped readers, a solutions page is featured in the back of the book. In the digital age, the ability to read a map remains an important tool for understanding spatial sense and visual literacy. All of the challenges featured in this activity book encourage people to better understand map legends and coordinates, and develop a love for discovery through everyday maps. Coloring fans can unplug and experience some of the world’s most unique and vibrant celebrations through 60 intricate and ready-to-shade illustrations in Amazing Festivals. Festivals include the magic of Paris’ Bastille Day to the innate beauty of Japan’s Cherry Blossom Festival. The book’s thick high quality paper helps to reduce the risk of marker bleed-through and adds a luxurious feel to each completed design.